Kirsty Allison is from London. 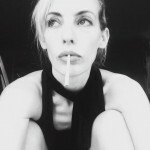 Editor and publisher of Cold Lips, and arts editor of DJ Mag, she has awards for writing, indie film and BBC radio. First writing professionally as a teenager, she trained as a journalist on style, music and culture magazines after running around in raves and pirate radio. In her early 20s she was DJing around the world with Irvine Welsh and Kris Needs. She began performing poetry in 2009, to break up the house-styles of working as a copywriter for fashion companies. Published in Vogue, The Guardian, Dazed, Elle, Ambit, Illustrated Ape, 3:AM, The Opiate and more, whilst working as a professor, in 2014, Shoreditch’s Red Gallery published Making Something Out Of Nothing, a manifesto she compiled on gentrification policies killing arts scenes. In 2015 she started an anti-literature club night which explored the space between lyrics and poetry, and she started Cold Lips, a printed magazine, aiming to continue the subculture that created it. All editions have sold out. She’s styled and made clothes for A-listers, and her art has shown at the Tate and Oscar Niemeyer. In 2016 she played live with Dave Barbarossa, drummer for Adam Ant & Bow Wow Wow – and is now collaborating with musicians, and making, and appearing in films, whilst writing more fiction. Moving to Peckham, she founded Vagrant Lovers with Gil De Ray, a collective of creatives, who share similar tastes and visions. Her debut novel will be published by Wrecking Ball Press.